PARCC participation has dwindled from 24 states to seven since 2010. As Illinois schools administer the PARCC standardized test this spring, state officials have been trying to find out why so many students skipped the tests last year, the Chicago Tribune reports. The state does not have a formal procedure to allow parents to opt out of the test on their children’s behalf, and state law requires schools to offer the test to every eligible child. So for families opposed to the test, the burden falls on children to refuse it themselves. Last year, 44,000 students did not take the PARCC exam’s English language arts component and 42,000 didn't take the math component — or about four percent of the more than 1 million students tested. Students who did not take the test typically were marked absent or flat-out refused to take the test. Those totals are plugged in to a state formula that determines whether schools and districts meet a 95 percent participation requirement. If at least 95 percent of eligible students at a school district did not take the PARCC test last year, the district was asked to explain why to state officials by April 30. State officials look at whether all students meet the 95 percent threshold and whether specific groups of students meet the requirement, based on their race and other factors. More than 400 schools did not meet the 95 percent participation requirement in each of the English and math exams, based upon state counts. That reflects about 12 percent of all the schools taking the exams in third through eighth grade and in high school. “Given the fact that it’s legally OK for a student to refuse the test, I find it interesting that there’s now an inquiry,” said Lindsey Hall, superintendent of Morton Community Unit School District 709, one of the school districts that did not meet the 95 percent threshold. “I’m sure the state wants to ensure there was no encouragement from schools.” Hall’s comments were quoted in the Peoria Journal Star on April 5. Federal law requires the Illinois State Board of Education to investigate school districts that don’t meet the legally required testing participation rate. “The reality is, in my district — and in districts throughout the state — we had an awful lot of parents who didn’t want their kids to take the test,” Hall told the Peoria newspaper, adding that he maintains files of letters and emails from parents opposed to the PARCC testing. The state’s inquiry is gathering “evidence and testimony” from school staff, community members, parents and “even students if appropriate,” according to a letter that state schools Superintendent Tony Smith sent to districts to announce the inquiry. The Feb. 18 letter said regional education superintendents in Illinois would gather the facts and report back to ISBE. The testing window for the spring 2016 administration of the Partnership for Assessment of Readiness for College and Careers (PARCC) assessment opened March 7 and continues through June 10. Districts selected their own 30-day testing period within that time frame. This is the second year that schools in the state have participated in PARCC assessment. Students in grades 3-8 and in select high school courses are taking the assessment in English language arts (ELA) and math. The statewide assessment, which debuted in spring 2015, is aligned to the new Illinois Learning Standards Incorporating the Common Core, and focuses on students’ mastery of key concepts as well as their critical thinking and writing skills. This year’s results will allow comparisons to show how well a child is developing knowledge and understanding of material covered by the state learning standards, which are focused on college and career readiness. ISBE expects to receive PARCC assessment scores much sooner for this year’s test than for the 2015 test, enabling teachers to tailor instruction to meet specific student needs and better support improvement efforts. Districts should receive score reports in the fall. About 85 percent of students are expected to take the assessment online this spring, compared to 75 percent in 2015. The remaining eligible test takers will take a pencil-and-paper exam. The goal is for all schools to eventually administer the assessment online. But the test remains a subject of controversy here and across the nation. 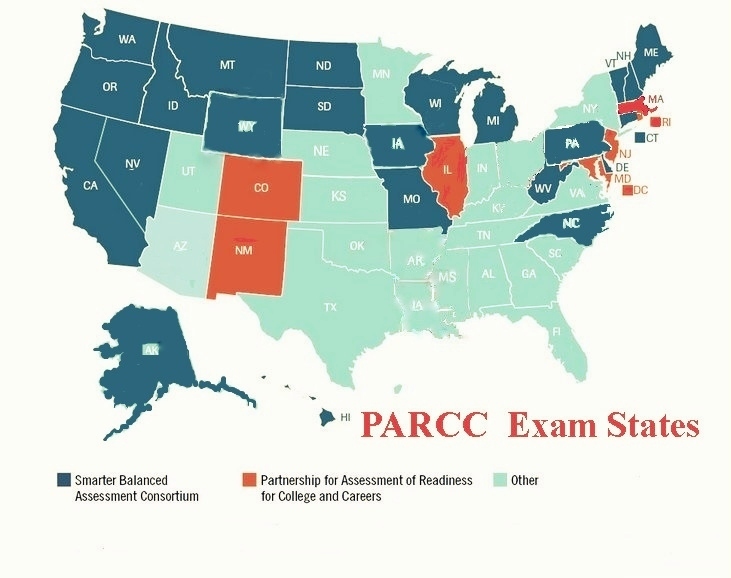 Illinois is one of just seven states, along with the District of Columbia, that still use the PARCC exam. One of those participating states, Massachusetts, will no longer use the test exclusively as its standardized exam next year; the Bay State will be switching to a hybrid test in 2017 that includes material from both the PARCC and its previous statewide exam. More information about the test is available at ISBE’s PARCC Place and ISBE’s Hot Topics page.